The Alumni assembled on stage dressed in unseasonal penguin suits…they couldn’t possibly have been anything other than uncomfortable! One unexpected, but most welcome, new face in the line-up was Harry Keeble. Leeds College of Music undergraduate Keeble made a big first impression at last year’s festival playing tenor during the Jazz Comes to the Quakerhouse session. 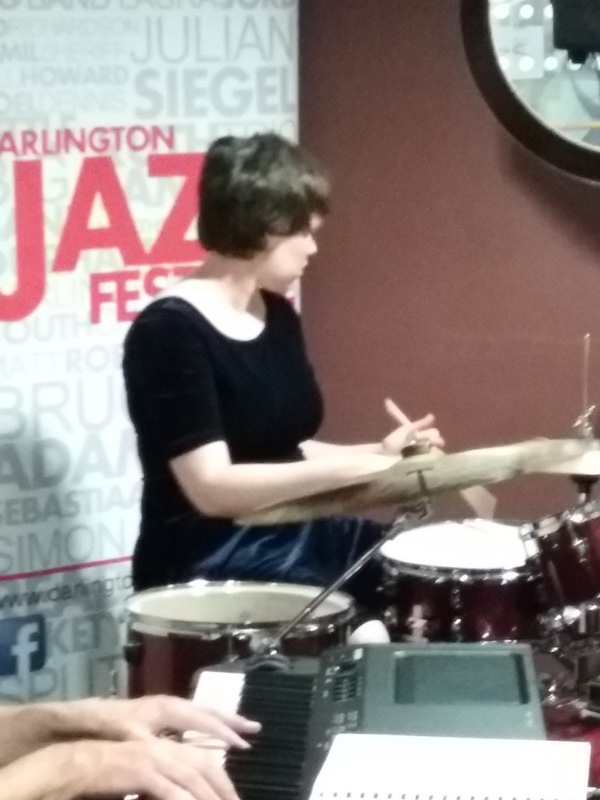 Subsequently heard sitting in at Newcastle’s Jazz Café jam session, we knew HK could play. And here he was in the reeds sitting to the left of the mighty Alex Baker! Other than HK it was the regular Alumni band. Al Wood, MD, boasts a CV the envy of most; he’s worked with just about everyone of note, and just about everyone else of little note! A multi-instrumentalist, tutor, friend of Darlington Jazz Festival, a jazzman to his core. Time to go to work…Come Fly with Me with Harry Keeble straight in there. A first solo for the young man from LCoM. Was fellow tenor Alex Baker making a mental note of HK’s opening gambit? A Billy May arrangement of You Turned the Tables on Me highlighted the trumpet section’s punchy introduction. The DABB’s trumpet section is as good as it comes – the senior duo Ian Robinson and Shaune Eland, plus three tremendously talented young ‘uns – Jonny Dunn, Tom Hill and Matthew Robinson. Lurking in the wings was guest star Alan Barnes, a glass of red in hand. Al Wood invited his friend – their friendship goes way back – to join the orchestra. Three quick-fire numbers featuring Barnes on alto confirmed his status as one of the most in-demand musicians working on the British scene. His opening contribution on Hello Young Lovers was as committed as anything the man has blown in recent times. Indeed, was that Barnesy blowing, drawing in air as he rested for a few bars? Yes, it looked like it, yet the man came back for more. If anyone in Central Hall was listening to Barnes for the first time then they won’t forget the name in a hurry! If I Should Lose You took it down, but not for long because the big band’s MD Al Wood had been busy arranging, or rearranging, Marty Paich’s arrangement for Art Pepper’s take on Opus de Funk from Art Pepper + Eleven, expanding it for the eighteen-strong Alumni. The band rose to the occasion, no doubt making our MD think it had been worthwhile burning the midnight oil. Barnesy went looking for another glass of something, leaving the stage to trumpeter Jonny Dunn. The Alumni recently took receipt of some of Don Ellis’ notoriously difficult charts. Dunn, stepping out of the section, took up the challenge of playing the trumpet solo on Ellis’ Parting. A scribbled note simply read: Fantastic! Steve McGarvie, alto, and Young Turk trumpeter Matthew Robinson soloed on a number Al Wood said was part of an album that, upon its release in 1957 ‘shook the world.’ The album, The Atomic Mr Basie, and the number heard here in Central Hall, Flight of the Foo Birds. Alan Barnes rejoined the band to take another look at one of his own compositions, Portrait of Belle from his seasonal A Jazz Christmas Carol. The composer said this was his attempt to arrange like Billy Strayhorn and play like Johnny Hodges. The packed hall was impressed with Strayhorn/Barnes/Hodges/Barnes. Bob Florence’s Carmello’s by the Freeway featuring the Alumni’s star tenor player Alex Baker in top form closed an excellent first set (Jonny Dunn, trumpet, and Barnesy on baritone also soloing). During the interval raffle tickets littered the many function room tables, a goodly sum was raised, the jazz economy in action! The on-stage action resumed with Alex Baker once again taking the spotlight on Louie Bellson’s arrangement of The Hawk Talks. A fine player is Baker. And equally fine is the man who hits top Cs for fun, as he did closing out this number, trumpeter Tom Hill. Two altos together – Messrs Wood and Barnes. This was a rare moment. As friends, they played Lanny Morgan’s Friends Again which is based upon Just Friends. A rare moment indeed! Barnes introduced Lover Man quipping that it should, perhaps, be titled Liver Man! Another rare moment followed – Barnesy directing the Alumni playing his own tune Marley’s Ghost. Veteran trombone man Terry O’Hern featured as did the man in the engine room, drummer Stephen Fletcher. Barnesy dedicated Cole Porter’s Easy to Love to Bebop Spoken Here’s County Durham correspondent Tony Eales. TE doesn’t care for the clarinet, so, Barnesy, rather mischievously, played clarinet! The evening was drawing to a close with Stephen Fletcher driving the band on Mexicali Nose before the finale – One O’clock Jump featuring all and sundry. 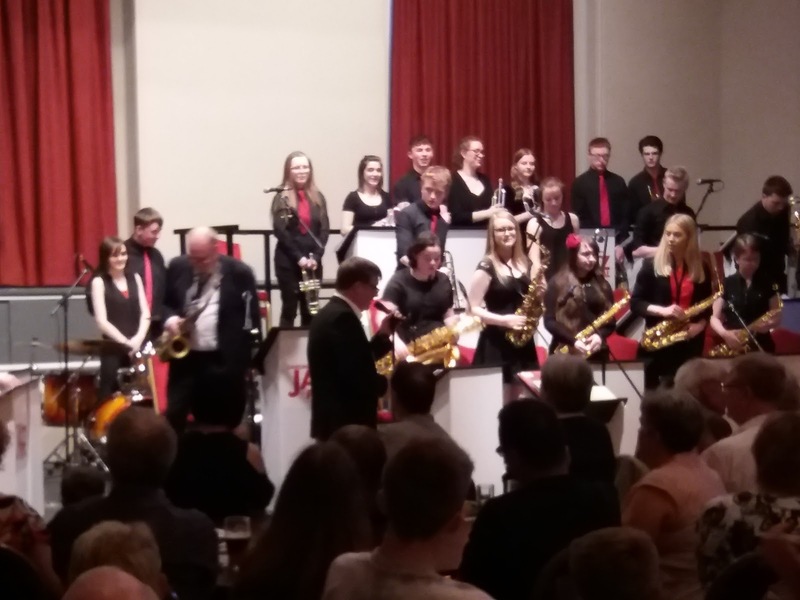 Earlier, the Durham County Youth Big Band played a short set directed by MD Shaune Eland. 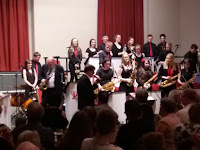 A varied set list – Earth Wind and Fire’s In the Stone, Frank Mantooth’s arrangement of It Had to be You, The Girl from Ipanema, strong solos were heard from all sections of the band. NYJO’s Mark Armstrong has recently been working with the band. Cotton Tail being one of the numbers they’ve looked at, it was time to play it in public right here in Central Hall. Good stuff! So good Armstrong has extended an invitation to the band to travel to London in July to play more big band tunes. It’s this sort of initiative that will help develop the next Alex Baker, the next Abbie Finn, the next Matt Roberts. Several members of the band have been known to sit-in at jam sessions around town and up the road in Newcastle. Beth Roberts is one of them and the alto saxophonist’s feature on the number one chart hit Saving All My Love for You deservedly won sustained applause. The band finished their set playing Matt Roberts’ commissioned piece Steam Funk. Inspired by the region’s railway heritage, the band, with Roberts, played the number at the National Railway Museum in Shildon. On that occasion Roberts played a crucial part…recreating the evocative sound of an ‘all aboard’ conductor’s whistle. This evening in Central Hall this most onerous of tasks was delegated to A. Barnes. The band played superbly, Alan Barnes joined them playing alto, and, most importantly, Darlington Jazz Festival’s guest star blew the whistle right on cue! A late night jam session followed in the café bar. Jeremy McMurray played piano, Abbie Finn, no less, was behind the traps, Alex Baker made a quick change from penguin suit to jeans and t-shirt to blow some late night tenor alongside Harry Keeble on Stolen Moments and it wasn’t long before Steve McGarvie pitched up alongside Newcastle University trombone-playing mathematics student Tom McDonald to play a few numbers (Autumn Leaves, Mr PC, Blue Bossa) before the ubiquitous Mr Alan Barnes joined the party. Alan Barnes (alto saxophone, clarinet).